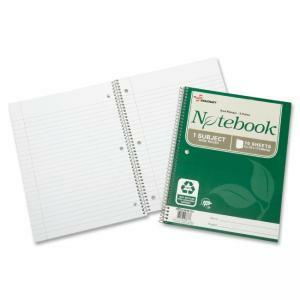 Single-subject, spiral-bound notebooks are made with 100 percent post-consumer material, giving new life to old paper. Acid-free, archival-quality paper preserves documents and prevents yellowing over time. Each 17 lb. sheet is wide-ruled with a red margin and has no perforation. Three-hole punched edge allows easy placement in standard, three-ring binders.